NASA's Mars Science Laboratory, also known as Curiosity, has been on the Red Planet since August 2012. The various instruments it brought along included a Mast Camera (Mastcam) with solar filters, allowing it to stare directly at the Sun. Last month it captured partial eclipses by Phobos and Deimos, which can be seen in the GIF animations below. 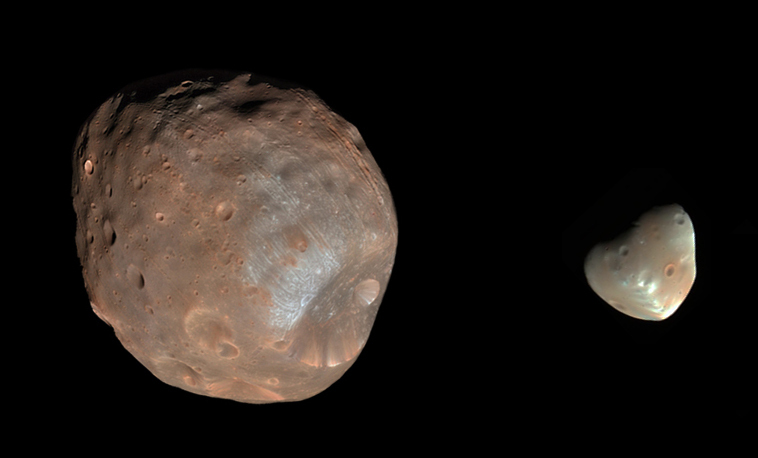 Compared to Earth's moon, Phobos and Deimos are very small. Phobos is the larger of the two, with dimensions of 27 × 22 × 18 km, but retains too little mass to be rounded under its own gravity. Deimos is 15 × 12 × 11 km and is likewise of irregular form. Despite their relatively tiny size, both moons orbit in close proximity to Mars, with semi-major axes of 9,377 km (Phobos) and 23,460 km (Deimos), enabling them to block a significant portion of the Sun.